Turbulence Ahead: Open For Business? 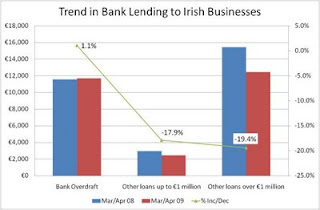 Today's Central Bank statistics add more to fuel to the fire about bank lending to Irish businesses. The latest data are for March and April 2009. I have taken Table B2.2 new business lending volumes to non-financial corporations and I have combined the monthly 2009 data and the equivalent 2008 data to determine what the year-on-year trend is. Note that Easter was in March last year but in April this year - so combining the two months offsets any potential seasonal influences. Nevertheless the picture is quite disturbing: overdraft facilities are up on last year - just (by 1.1%). But smaller loans (under €1 million) are down: by nearly 18%. And larger loans (over €1 million) are down by over 19%. In the case of the latter there appears to have been a collapse in longer term loans of over 5 years duration between March and April 2009. I have no idea why. Sure there's a demand side component Fergus. 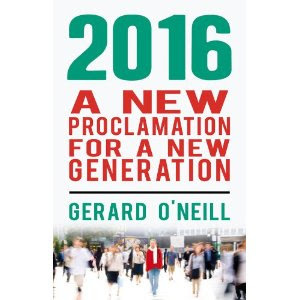 The Central Bank data therefore reflects the 'net' outcome of demand and supply for credit. There is, however, a great deal of survey evidence from ISME/SFA etc to suggest that demand exceeds supply at present. I don't doubt that unprecedented contractions in economic activity will - other things being equal - reduce business demands for credit. But the strange thing is that the UK has had its own unprecedented economic contraction and yet Bank of England statistics show a year-on-year increase in business lending. Which says to me that we have our own unique supply side factors that are making a bad situation much, much worse. I simply don't understand the UK data, but it is a very different economy. As for the ISME/SFA surveys, they simply confirm the insatiable appetite - not to mention gargantuan sense of entitlement - of small businesses for more credit, whatever the economic background.